ThinkTank has been designed to act as part of a suite of tools. 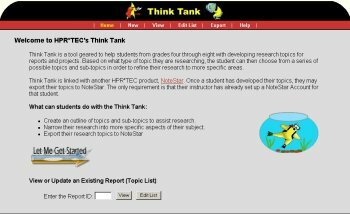 Currently, NoteStar (http://notestar.4teachers.org) is set up to work with ThinkTank. NoteStar allows students to take notes online and keep track of their online citation information. Below, we will describe how to export your topics list to NoteStar. To begin, click the Export link from the red navigation bar at the top of the ThinkTank home page. This page first requests that you enter your login information for the ThinkTank topics list that you wish to export. When finished, click the Continue.. button. Below, the Export Introduction Page provides some details regarding what lies ahead. This page now requests the login information for the NoteStar account to which you will be exporting. In the NoteStar User Name field, type the user name given to you by your teacher. Once finished, click the Next -> button to continue. You are now given a list of projects. Click the link of the project you are exporting to. This will begin the export process. The page below is the confirmation that your export has successfully completed.